Many people who rely on a home office don't consider these questions. As a result, their office is either uninsured or underinsured. This article will explain why a typical homeowners policy may not provide adequate coverage for your home office. Many business owners who work from a home office assume that their homeowner's policy will protect them against any property or liability losses that might occur. This assumption is incorrect. A typical homeowners policy contains a number of business-related exclusions or limitations. Limited coverage for damage to property used in a business. This limit may be as low as $2,500. An even lower limit, such as $250, may apply to property (like a laptop) that is away from your residence. bodily injury or property damage arising out of a business engaged in by an insured. This exclusion also applies to Medical Payments Coverage. These definitions are quite broad. Some would include virtually any business operated from a home office. In some policies, business does not include volunteer work, home day-care services provided free of charge, and certain other activities. 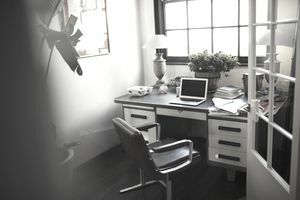 What can you do if your homeowners' policy provides insufficient coverage for your home office? You have several alternatives. Many homeowners insurers offer endorsements that expand the scope of coverage provided for business property. For instance, some insurers will increase the $2,500 limit on property used in a business to $10,000 or more. Other insurers offer a Home Business endorsement. This endorsement extends the policy to cover a business owned by the policyholder if the business meets certain requirements. For details on how to expand your policy, consult your insurance agent or broker. A BOP is a package policy designed for small businesses. It includes both commercial property insurance and general liability coverage in a single policy. Some insurers offer a BOP designed specifically for home-based businesses. A BOP is a commercial policy. It will not replace your homeowners' insurance. You should consider a BOP if you have frequent business visitors to your home office (delivery people, couriers, clients) and are concerned about liability. A third option is to purchase a monoline business policy. For example, you could purchase a commercial property policy to protect your business against loss or damage to your office furnishings and equipment. If you don't need property coverage, you can purchase a general liability policy to protect your business from third-party claims or suits. Before buying insurance for your home office, you should assess your risks. First, take an inventory of all the property you use in your business, including computers and software. Next, you'll need to determine the replacement cost of your business property. You can check the prices of new furnishings and equipment at your local office supply store. The total replacement cost is the minimum limit of property insurance you'll need. Next, consider the risks to your valuable documents and electronic data. Do you store contracts or other important papers in your office? Do you keep client lists or company data on your home office computer? Is your data secure? Your data is not secure if family members can access the information. Do you employ contractors or domestic help who may access your paper documents, and electronic data and records? If these items were lost or damaged, what would it cost to replace them? If the costs would be considerable, you may need valuable papers insurance and electronic data processing coverage. Thirdly, consider the effect of a physical loss on your income. If a physical loss to your business property forces you shut down your operations, would your business lose a substantial amount of income? If the answer is yes, you should consider purchasing business income coverage. Finally, consider your liability risks. Do customers, business associates, package delivery personnel or other people visit your office? If so, consider purchasing general liability insurance. If your business performs a service or provides advice to others for a fee, you may need errors and omissions liability insurance. What Is Covered by a Business Owners Policy? Do You Really Need Business Insurance? What Insurance Coverages Does Your Restaurant Need? Do You Need Terrorism Insurance? Oh No! It's a Non-renewal Notice! Don't Make These Mistakes When Buying Business Insurance! Should You Buy Business Insurance Online? Should You Buy Special Event Coverage? What Are Torts, and Are They Covered by Insurance?